No trip to the Lake District is complete without a classic ferry ride across Lake Windermere or a boat ride on one of the many other lakes in the area, such as Ullswater, Derwent Water, and Coniston Water. These rides provide a great alternative to driving, as you are completely submersed and surrounded by the pictorial beauty of the Lake District. 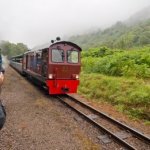 There are also a couple of heritage railways that take you through picturesque valleys with views of the stunning lakes, rivers, and rolling green hillsides. Explore England’s largest natural lake and experience Cumbria’s most popular tourist attraction with a cruise aboard one of Windermere Lake Cruises’ fleet of modern and traditional style ferries. With a mixture of long cruises and short one way trips available the ferries are a great way of exploring the vastness of Windermere in comfort and style. 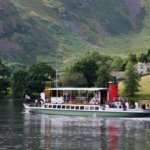 The iconic Ullswater Steamers have been in operation at Ullswater for over 150 years, ferrying passengers between Pooley Bridge and Glenridding taking in all the sights on the way. Today the steamers have various stop off points around the lake allowing you to explore the beautiful landscapes that surround Ullswater, whilst one of the steamers is thought to be the oldest working passenger ferry in the world. 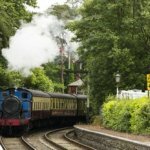 Step back in time and explore the south Lake District countryside at the Lakeside and Haverthwaite Railway. Saved from abandonment and lovingly preserved for future generations, the railway allows you to travel in style in traditional carriages pulled by steam locomotives. 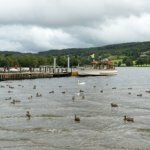 You can even get combined tickets that include a trip on the Windermere Lake Cruises and entrance into local attractions. Explore some of Cumbria’s most inaccessible landscapes aboard the Ravenglass and Eskdale Railway. This heritage minimum gauge railway was once used to transport mined ore from the mines above the village of Boot, but is now a popular tourist attraction with daily services running throughout most of the year. A steam train will pull you from the village of Ravenglass to the village of Boot with plenty of stops along the way. Less popular than its peers in Ullswater or Windermere, the Derwent Water Cruises offered by the Keswick Launch Company give visitors a chance to explore the spectacular scenery around Derwent Water and are convenient for visitors to Keswick. Sailing almost all year round, the cruises take you to some of most delightful hidden spots around the lake that are inaccessible by car, whilst private boats can also be hired from the company. 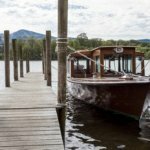 Allowing you to explore one of the more remote areas of the Lake District, the Coniston Launch is not as popular as its Windermere counterpart, but still offers fantastic scenery and tranquillity from the comfort of a traditional timber boat. With stops at various jetties along the lake shore you could combine your cruise with a trip to Brantwood House, or a walk up the Old Man Of Coniston fell.